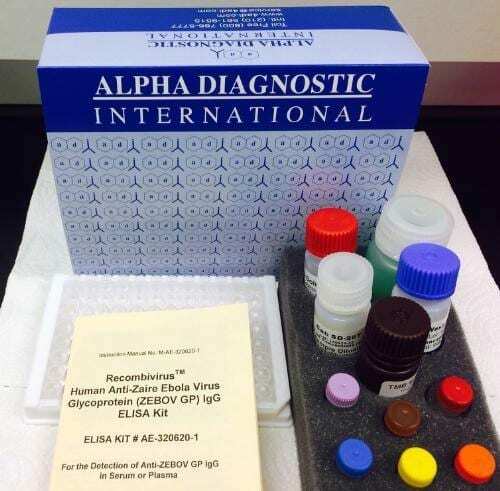 Alpha Diagnostic Int’l (ADI) has announced availability of several rapid, and sensitive ELISA test kits for the detection of major Ebola viral protein antibodies including Glycoprotein (GP), Nucleoprotein (NP), and Viral Protein 40 (VP40). The antibody ELISA kits are available not only for human samples; but also for monkey, dog and mouse samples in support of Ebola countermeasures research in animal and primate models. ADI’s test kits can be used to determine if Ebola survivors have antibodies prior to giving a blood donation. “More importantly, a population survey can be done to determine the immunity levels of Ebola in endemic regions,” said Dr. Masarrat Ali, Director of ADI. The levels of antibodies sufficient enough to provide immunity also need to be established. ADI has made similar antibody kits for dog and pig samples to establish if the animals from Ebola endemic regions have any circulating Ebola virus protein antibodies and, therefore, exposed to Ebola virus. The antibody ELISA kits are highly sensitive and need only a tiny drop of blood or serum to conduct the test within two hours. Zmapp, an experimental therapeutic cocktail of three humanized GP monoclonal antibodies, has been used in some Ebola patients in order to neutralize the Ebola virus. The U.S. Department of Health and Human Services has provided $42.3 million to help San Diego-based Mapp Biopharmaceutical accelerate the development and testing of ZMapp. ADI has developed ELISA kits to not only measure the Zmapp antibody concentration in its purified form but also after infusion to humans or animals. For example, it is possible to establish the levels of Zmapp in Dr. Brantly’s blood immediately after the first dose and then weeks and months afterwards. It is also now possible to assess what levels of Zmapp, natural antibodies, or antibodies induced by vaccines are sufficient to prevent an Ebola infection. The Ebola antibodies test is conducted in less than two hours in a laboratory in field setting with minimal instruments or equipment. “The availability of these kits should help diagnose Ebola in humans and animals and allow for rapid testing of various Ebola vaccines,” said Dr. Ali. ADI, established in 1993 in San Antonio, Texas, USA, is a biotech company engaged in developing and testing vaccines for malaria, cholera, anthrax, Ebola, Japanese encephalitis, universal influenza, Congo, and papilloma (HPV) viruses. Source: ADI press release, adapted.